I have never followed an intense exercise routine. I am a big believer in ‘all things in moderation’ — in both food and physical activity. 1. 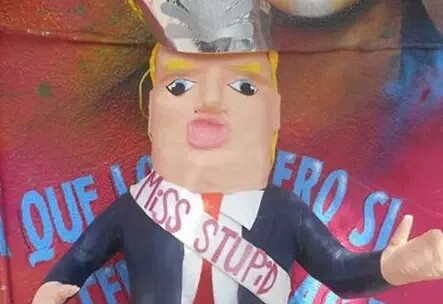 Buy pinata in likeness of annoyingly-ignorant businessman and Republican presidential candidate. 2. Get really big stick. 3. Beat the crap out of that thang, honing upper body strength while reducing frustrations with Trump and flawed political process. 4. Repeat 2-3 times each week. Note: if you put candy in pinata per tradition, this could reduce positive outcomes of routine. This entry was posted in Business, Celebrities, Comedy, Exercise, Health, Humor, Life, Politics and tagged Business, candy, celebrities, comedy, Donald Trump, exercise, Health, Humor, life, pinata, politics, upper body strength, workout. Bookmark the permalink. They are making them in Mexico — time for vacation!